Admiralty Sailing offers family friendly sailing for all ages. 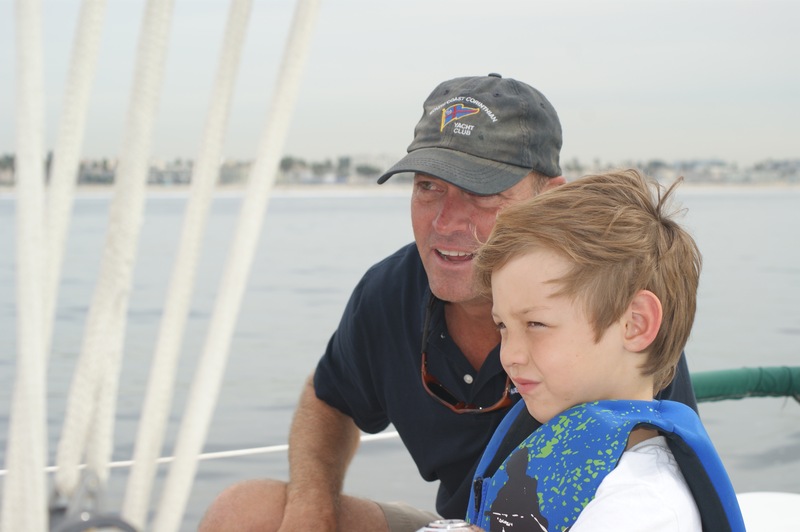 Admiralty Sailing, based in Marina Del Rey, provides 3 and 4 hour family fun sails, couples sails and instructional sailing charters on Santa Monica Bay, out of beautiful Marina Del Rey Harbor in Los Angeles. 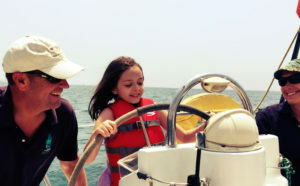 On all of our cruises you can take the helm and learn a few maneuvers and have your picture taken with you at the wheel. 3 hour charters are a great way recognize your co-workers like the owners of Flower Duet did with their floral designers. (2-6 People). From the slip we have a scenic motor through the marina for about 20 minutes to reach the breakwater. We set the sails and sail past Venice Pier towards Santa Monica Pier and at the 60-90 minute mark, we turnaround and sail back, enjoying the view of the beach on our left. the ocean to our right and Palos Verdes and Catalina Island just off the bow. We’ll look for and probably see sea lions, pelicans and many other birds. (Maybe even a dolphin). Suggested times: 12-3, 2-5, 3-6, 4-7. 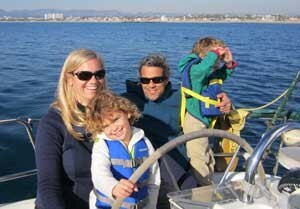 Captains Stu and Shari coaching our skipper on the way to Santa Monica Pier. Captain Stu coaching a young guest on steering the sailboat, Reliance. Admiralty Sailing encourages all guest to take the wheel for a photo opportunity or as much as you’d like!. 4-hour Sail $490 Flat rate. (2-6 People.) If you really love sailing and want to spend 4 hours out in the ocean, this is the sailing tour for you. From the slip we have a scenic motor through the marina for about 20 minutes to reach the breakwater. We set the sails and sail past Venice Pier, past Santa Monica Pier and sail out toward Malibu or sail South toward the Tankers off El Segundo and do some plane-spotting! 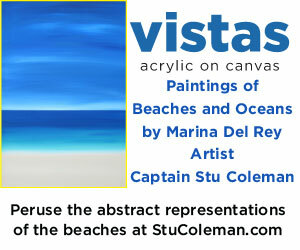 We’ll look for and probably see sea lions, pelicans and many other birds like cormorants, terns and seagulls. Pick your day. Pick your time! If 4 hours seems too long, why not try a shorter sail? 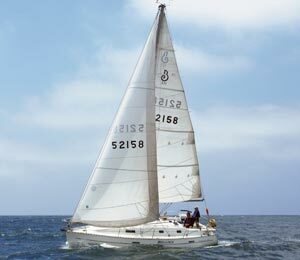 Call or Text 323-314-2963 or send an email to book your sailing boat charter now! Does the weather look good this weekend? Let’s go sailing. Want to plan for this weekend but might have to reschedule? No problem. All deposits are refundable. All trips can be re-scheduled at no cost. We are going sailing this weekend. Why not you? Call or Text 323-314-2963 or send an email to discuss your schedule and what you want out of your sailing experience and we will make it happen. 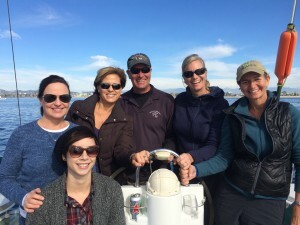 Want to give the gift of sailing? 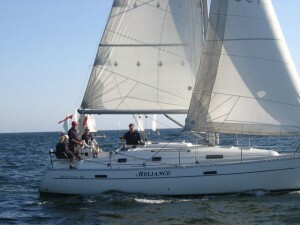 We offer 3 hour gift certificates for sailing. Please email for details.